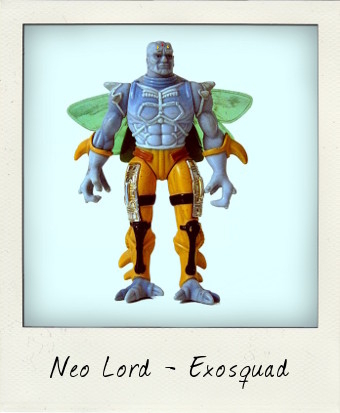 Neo Lord – Neosapien Super Warrior from Exosquad! 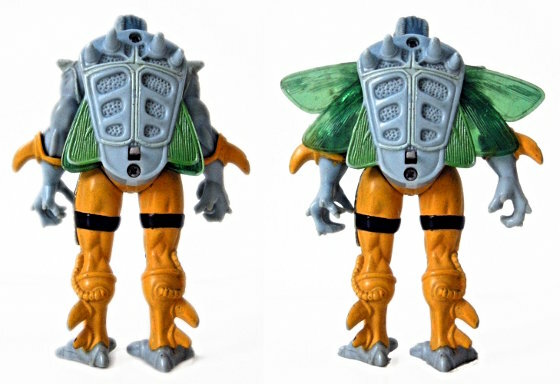 I confess that when I found this ugly-looking bruiser in a flea market recently I didn't immediately recognise him and needed to do some sleuthing on the Internet to put a name to his gnarled face – Neo Lord, one of the Neosapien Warriors from the 1995 Playmates Exosquad action figure series. Originally launched in 1993 as spin-off toys for the Japanese anime-inspired Exosquad cartoon series created by Universal Cartoon Studios, like all self-respecting toy lines the Exosquad action figures and vehicles came packaged with fully fledged back stories which helped to expand the entire Exosquad universe lore. Our Neo Lord here, for example, was the result of monstrous genetic engineering, to create a super being - shrewdly analytical, with the physical strength of ten rhinos, the ferocious talons of a hawk, and the wings of a wasp, he was also almost invincible in battle thanks to his protective armour shell. It seems that my first assessment was correct - what a thug! Neo Lord - Spring-activated battle wings! Measuring just over 4 inches in height and with only the five standard points of articulation at the neck, shoulders and hips, the spring action expandable wings operated by a switch on his back, are clearly the best feature with this figure, although the molding and paint design overall are also well thought out, with some nice attention to detail such as belt straps and the various areas of armour picked out in different colours and vac-metal finish on the thighs. He's an appropriately chunky figure and also stands very well unassisted with wings both open and closed. Originally issued with two pieces of Metallic Assault Armor as accessories, my loose figure lost those a long time ago and has seen some heavy play wear – a fun find, nevertheless!